My Local Card Shop is Dead A Brief Essay Uncle Bill, The Mick and Me A Tale of Two Fellers I Dream in 2½ by 3½ A Card Collector's Worst Nightmare Mr. Mint The Memory Business Topps Wax Prices - Inflation or Conspiracy? 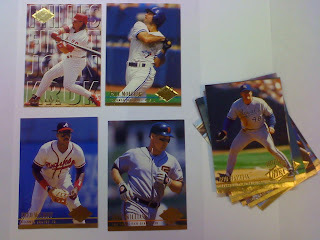 64, 83, 85, 140, 154, 220, 287, 288, 294, 296, 430, 590 and Phillies Finest Insert #6 (John Kruk). As always, all unclaimed cards are going to my 1,000,000 Cards for Kids side project, and I can hold your claims until you get enough ammo for a trade. Remember, first come, first served in the comment box. i'd like that molitor, too. happy birthday!